Houston Rockets produced a superb performance as they started the NBA preseason with a win against Oklahoma City Thunder at BOK Center, Tulsa. Coach Billy Donovan’s squad dropped its opener to the Rockets, 97-104. The Rockets made 24 3-pointers in the game where Sixth Man of the Year Eric Gordon had six of his 21 points and Trevor Ariza hits five to his 18. Meanwhile, James Harden contributed a double-double with 16 points and 10 assists while All-Star point guard Chris Paul got 11 points and seven assists in his debut with Houston. 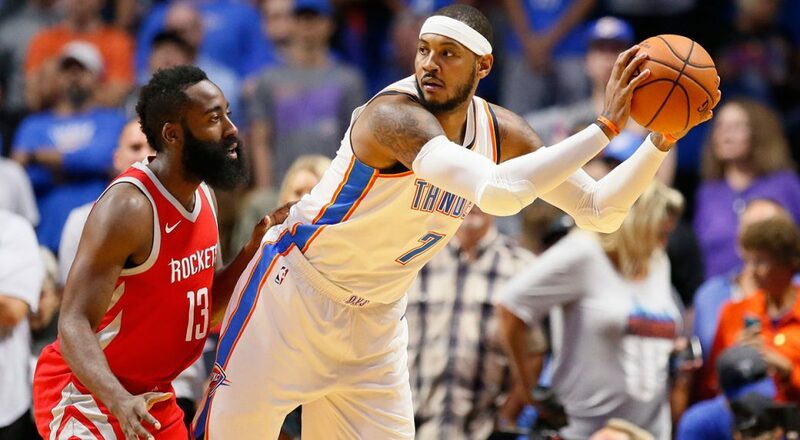 For the Thunder, Carmelo Anthony led the team with 19 points and fellow newcomer Paul George had 15 points with 5 rebounds and 2 assists in their debut. As the preseason continues, it is expected that the Thunder and other teams in the NBA will look to find more chemistry and fluidity in their offense in the game. Thunder will be back in action on Saturday morning against the New Orleans Pelicans. On the other results of the match, New York Knicks played their first game without Anthony and they lost 107-115 to the Brooklyn Nets in one of the four games on the NBA’s preseason schedule.